A true excursion vehicle and a home away from home our Pacific Explorer delivers strength and quality at every corner. The hull is a full quarter inch thick and eight feet wide, so you can ride out those waves with serious safety and stability. Plus, it’s still trailerable when you want to get it out of the water. Within the cabin, the dinette and galley options are made with real mahogany—standard. The sleeping cabin in the v-berth has a hatch for you to step out onto the bow, and the roof is strong enough to hold your crab pots or kayaks. And let’s not forget about fishing. 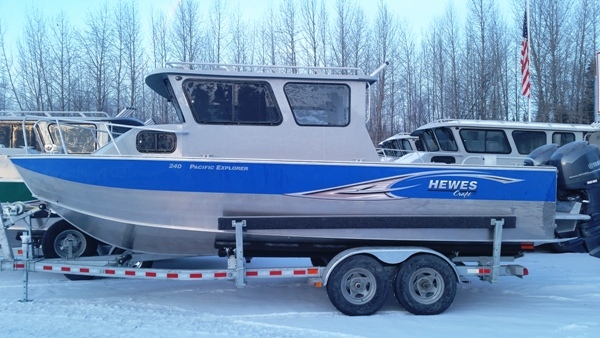 The Explorer is our only model with a self-bailing cockpit floor and two huge, diaphragm-pumped, in-floor fish boxes. So what are you waiting for? It’s time to explore. Beam 102" 2670cc I 163.0ci Weight 1950 lbs.